Yeah Skarvs, it was definitely the poor quality food and not the fact that you’ve been levitating your friend and yourself and raised an entire island the depths. Welcome back! 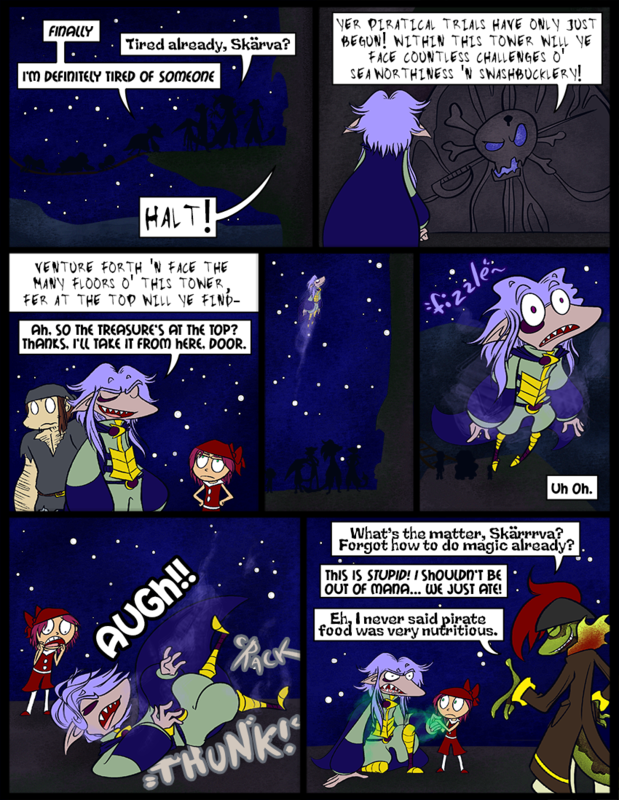 Our little break was nice, but it certainly feels good to have a new comic up again. I hope you guys all had good holiday seasons! And here’s a special announcement, if you missed it. You’ll want to read it so you’re not totally thrown by what’s going to happen in a few months…! 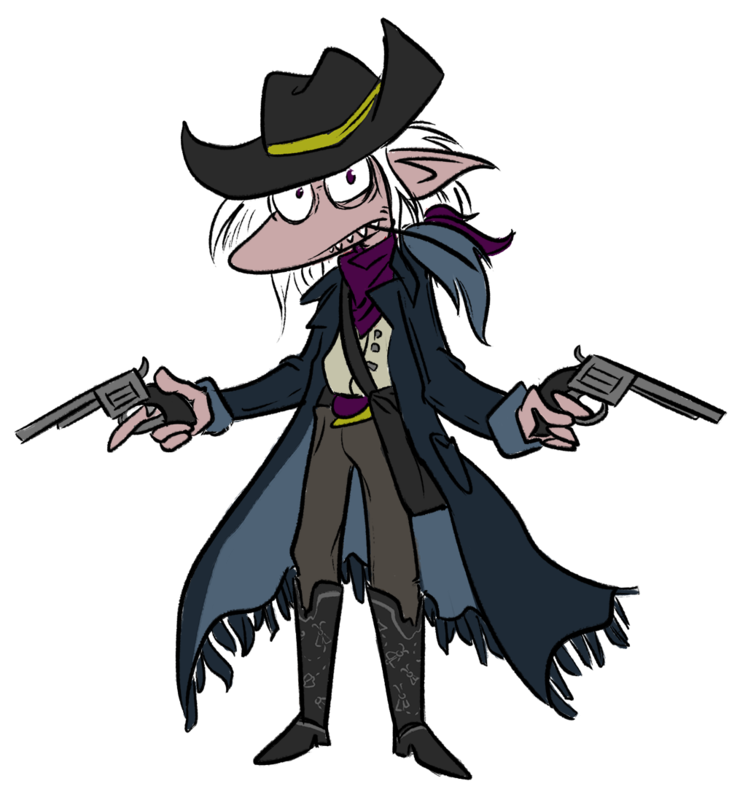 OH ALSO I had a dream where the Second was reanimated into his somehow pristine yet still deceased body and became an undead cowboy, and then I drew it. Enjoy! Gotta get out the milk shakes! But wait, oh snap, how’s he gonna handle the rest of this mission if he’s got no magic? Doesn’t he have to fight another zombie pirate Mage thing??? He’ll just have to do it the Muggle way! Oh no! Does Sammiches Sandwiches deliver? What about Derk’s emergency bacon? They ate that when they were in prison! Yeah. I’m pretty sure the dream was partly inspired by Back to the Future 3… Victor was watching it not long ago. In fact, I think he even had a woman in his life in the dream. Which for many reasons, seems very unlikely. We’ve seen his son and grandson (III and IV), though. Presumably they had mothers, right? A stork brought the Fourth and the Third was found in a cabbage patch! So do all the different gates contain the same entity, or are they all different? I’m really digging the cowboy shark. Maybe he’s the side story? They’re basically enchanted to have a mimimal artificial intelligence. They’re not the same entity (hence why the second skull didn’t know how Skarvs had made it past the first). Only rarely. Usually they make absolutely no sense, or are about really mundane things. For at the top, ye will actually find a boss battle. Which Skärva is going to fight with no mana, of course. He’s the boss to end all bosses! He can do it! …with a little help from his friends. Ridiculous mana tank that girl has. Then again, she hasn’t been running around recklessly magicking today like SOME people. Magic does NOT go fizzle all the time. Fizzle is a bad sign. Unless it’s the ancient Spell of Fizzling, found in the Fizznomicon. Yeah he really dropped the ball on this one.